Owned by the Great Lakes Dredge and Dock Company, the scow was on a dredging job in the American canal of the Niagara River on August 6, 1918. While being towed by the tugboat "Hassayampa" to another location, the tug hit a sandbar and the line holding the scow snapped. She was suddenly adrift in the Niagara river, and her two deck hands, Gustave Lofberg and James Harris, were very aware that they were in trouble. The scow slowly moved from the more controlled American channel into the rapidly moving Canadian waters, and began heading straight for the Horseshoe Falls. The Niagara Scow, as seen from above. Photo by Heather Elliott, 2010. What happened next depends on what source you read. Some sources claim that the deck hands opened the door in the bottom of the boat, dropping the silt they had dredged that day and using the door to hold themselves against a rocky shoal. Another source claims that there would have been no time for them to open the bottom of the boat, and that it was simply luck that they hit the shoal when and where they did. This source went on to say that the men then moved their payload, by hand, into the front hold, to help secure the wreck and prevent it from shifting. Either way, the two men found themselves grounded in the middle of the Niagara river, with the roar of the Falls a mere 767m away, wondering what to do next. Lofberg tied himself to the scow, figuring that if it somehow happened that he ended up in the river, he wouldn't be going very far and could be saved. Harris, on the other hand, tied himself to a barrel. His logic was that if he did end up in the river and headed for the Falls, he hoped that the barrel would snag on some other rocks and he would be safe until someone could retrieve him. Both men sat and waited, as observers on the shoreline scrambled to try and save them. The scow, firmly wedged in between the rocks of the river. A group of rescuers had congregated at the Toronto Power Company Building which was almost directly across from the wreck. After deciding that no other boat could be sent out to try and retrieve them, and the Niagara Fire Department tried firing a rope from a life saving gun that fell short, a man from the Life Saving Station arrive with a Lyle gun. This was loaded with a heavy rope line which was fired towards the vessel. The two men were able to haul the heavy line aboard and secure it to a makeshift windlass they had created using beams from the scow. A was erected, but when the chair was sent over it became snagged. Workers on the shore made signs so that they could communicate with the men on board, and as darkness fell, they lit up the scow to let the men know that they had not been abandoned. Now was the time for a show of true bravery. William "Red" Hill Sr., a local daredevil, climbed out over the line at 3am, hand over hand, and after hours of work finally untangled the breeches buoy. The following morning he ventured out again, this time getting close enough to be able to communicate with the two men. He directed them to untangle the rope which was preventing the breeches buoy from working properly, and then returned to the safety of the roof of the Power Company. Slowly, and suffering from fatigue and exposure, the two men were removed from the vessel and helped to shore. Lofberg and Harris were stranded on the scow for over 29 hours before they were rescued, and I'm willing to bet that the journey to safety, even though it only took a few short minutes, was the longest of their lives. "Red" Hill Sr. won the Carnegie Life Saving Medal for his role in the rescue, which just added to the reputation of lifesaver that the man had already begun to develop. The scow, as seen from shore. The scow is still sitting there today, though it has deteriorated significantly over the years. Another vessel, a sub-chaser was another wreck that occurred in the same area just 5 years later. 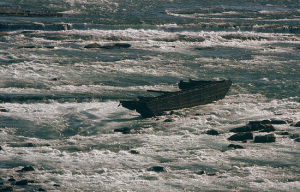 While not much of her remains, the scow is still a well known sightseeing item when you visit the Falls, although if is to be believed, she won't last to see her centenary. If you want any other information on the scow, I recommend reading this article here. The images I have used that weren't my own came from this site. Finally, if any of you happen to find yourselves down by Niagara Falls, try this exercise: Look out at the scow, and watch how quickly the water is moving. Then, imagine being strapped into a chair, dangling above the water, and being pulled slowly towards the Toronto Power building on the shore. I can't imagine how scary that must have been for them, or the sense of relief they must have felt when they finally felt ground under their feet. Well, that's all for this week's "Over the Waves". As always, if you know of a wreck or a story that you want to know more about, please don't hesitate to contact me. You can reach me through the contact page on this site, or my Twitter account, @OriginalShipstr!